At Sninski & Schmitt Family Dentistry we offer dental implants to our Holly Springs and Cary patients in need of a permanent solution for missing or damaged teeth. Though dental implants may not be right for every patient, they are a great option for patients who qualify. Dental implants give patients with missing teeth or teeth damaged beyond repair a new smile. The implant process involves surgically positioning a titanium post that acts like a tooth’s root into the gum where a tooth is missing. Replacement teeth are then attached to the post, leaving the patient with a very natural-looking new tooth. Most patients that are healthy enough to undergo routine oral surgery can get dental implants. Good candidates will have healthy gums and enough bone to hold the post and implant. Dental implants may not be suitable for heavy smokers or people with chronic diseases like diabetes and heart disease, but we evaluate patients that fall into these categories on an individual basis. Unlike dentures that can slip and move around, making it difficult to talk and eat, implants are securely attached to your jaw. Because of this, they are much more comfortable than other artificial teeth. Most patients report a rise in self-esteem after replacing their dentures or bridges because implants look natural and do not move around in the mouth. Another benefit to implants is that they don’t disrupt surrounding teeth. Regular bridges must be attached to the teeth on either side of the missing tooth, sometimes requiring those teeth to be filed down to accommodate the bridge. Implants do not require this, leaving your other teeth unaffected. 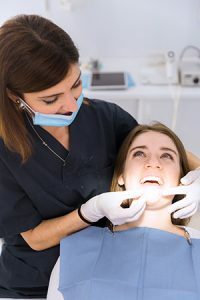 Maintaining good oral hygiene is crucial to the success of dental implants and caring for them is much like caring for your natural teeth: brush twice a day, floss at least once a day, and be diligent about seeing your dentist every six months. Patients that receive implants should stop smoking, as it can weaken your bone structure and cause the implant to fail. While most insurance plans do not cover any portion of dental implant surgery, some do cover a small portion of the costs. Contact your insurance company or consult your benefits pamphlet for more information on coverage. If your plan covers dental implants, we will file the claim for you. The remainder of the balance not covered by insurance will be due at the time of treatment. If you have missing or damaged teeth and would like a solution that is more permanent and less damaging than bridges or dentures, dental implants might be a good option for you. To schedule a consultation with the team at Sninski & Schmitt Family Dentistry, call our Holly Springs office at 919-600-6262 or our Cary location at 919-467-2203 or fill out our convenient online form.